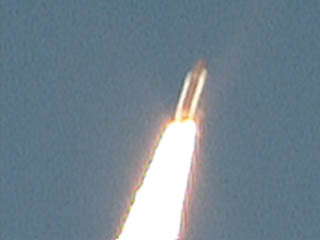 On February 11, 2000 I was treated to the launch of STS-99, the Shuttle Radar Topography Mission. The weather was clear and beautiful. 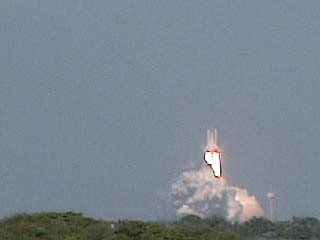 With just a few quick issues to resolve at the T-minus-9-minute hold, the shuttle launched just 13 minutes after the launch window opened. From our previous launch experience, I knew the shuttle would be momentarily hidden by steam when the engines fired, so I zoomed out a bit so that the shuttle was visible as it lifted above the cloud. 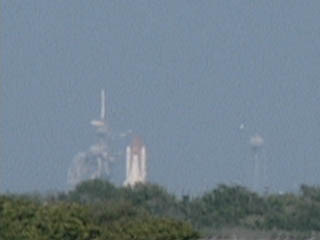 By the way, the initial cloud isn't exhaust, it's from all the water they dump on the launch platform to absorb some of the heat and protect the launch pad as the engines hurl the shuttle into space. The nearest public viewing location is a causeway that's about six miles from the launch pad, so it takes around 30 seconds before you hear the roaring sound of the engines that light up the sky like a torch at arm's length. To play these movies, you'll need QuickTime 4.0 or later. You can get Apple's free QuickTime Player for Macintosh or Windows from Apple. If you're not sure you have the right software to play the movie, try the short one first. Congratulations to NASA and particularly the crew of STS-99!